It's been a little over a week since we had Kirby put to sleep. We are still trying to adjust to our new normal. I knew that Jim would have a hard time because Kirby was his little buddy - they had a mutual love affair going on. I loved Kirby as well, and I know he loved me, too. But I played second fiddle if Jim was around, despite me being the one who was in the house with Kirby all day. But I underestimated how much I would miss the little guy. Everything in the house reminds me of him, especially when I am cooking. I got the can opener out to open some tomatoes. He would have dashed to my side, hoping I was preparing some tuna or canned chicken. The cutting board? He was always right there in the hopes that I was cutting up ham or chicken. It will be a long time before I can buy ham at the deli, as that is what I wrapped all of his pills in so that he would eat them. And I don't think Jim or I will be able to eat a hard boiled egg for quite a while. Kirby loved those, and he and Jim shared one each morning. Last Wednesday the trash bins did not get rolled back to the house because I always grabbed them after our afternoon walk. And the W-K Times didn't get picked up Friday morning because Jim and Kirby would get it after their morning walk. 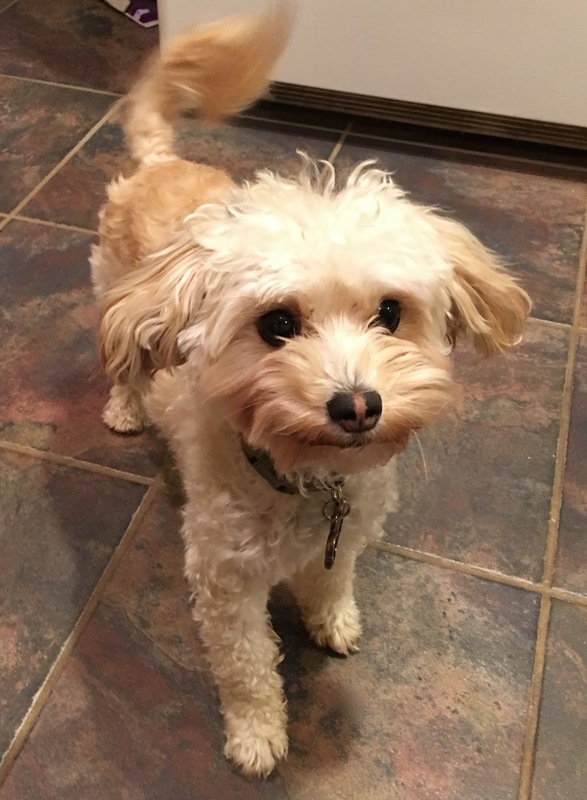 We both find ourselves leaving a last bite of meat on our plates because we would save Kirby a treat each meal. Friday I came home to a message on the answering machine from the emergency clinic with "some information about Kirby". I almost didn't return the call, but I knew it would be hard for Jim to do it as well so I just got it over with. As I suspected, they wanted to let us know that Kirby's ashes were ready to be picked up. Jim had requested that he be cremated. I confirmed that they would hold the ashes until we were ready to come and get them. When is one ever ready for that? I am still traumatized over my dad making me go to the vet to pick up the collar and leash of our German Shepherd after he died on the operating table when I was in college. But Jim was out yesterday afternoon, so he did stop and pick up the remains and settled our bill. He said it was terrible. He felt the eyes of the other pet owners on him as they sat in the waiting room with their pets on a leash while his was in a box. When he got home, he told me not to freak out, but that Kirby was in his favorite spot. I peered into the conservatory, and sure enough Jim had set the box on the couch where Kirby had spent most of his time. 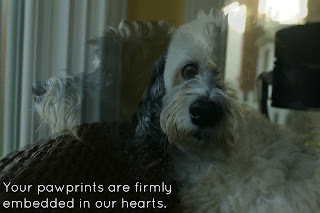 He loved sitting in the corner of that couch (or on top of the cushion) so that he could watch for Beloved (as I referred to Jim) come home from work. It was a jolt to see the box in his corner. One surprise is that the emergency clinic had made a cast of Kirby's foot to give to us. It was a nice gesture that I am sure we will appreciate at some point. For right now it is another reminder of what we are missing. We received sympathy cards from our new vet as well as the emergency clinic. A couple of friends have sent cards as well. My Facebook post about Kirby's death received over 100 comments in addition to all the emoticons people tagged on it. It is comforting to know that he touched so many people in his ten years with us. I know that we gave him a great life, and he in turn graced us with much love and happiness. But right now our new normal doesn't feel very normal at all. Late yesterday afternoon we had Kirby put to sleep. In the past few days he had seemed more restless, particularly at night. He spent a lot of time on the tile floor of the conservatory, despite the cold temperature. The conservatory was definitely his room, with the couch serving as his throne where he could observe his subjects - the birds, bunnies and cats who traversed through our yard. And where he could watch for his most loyal subject (Jim) to arrive home. It was unusual for him to be spending so much time on the hard floor. His tumor had continued to grow, but did not appear to be bothering him until yesterday. He had eaten well in the morning and taken his pills nicely for me. He and Jim took their normal long morning walk, and then we went out to do some Christmas shopping. Kirby still seemed fine, and Jim went to the office to do some work, and I headed upstairs to try to look at a website issue I've had ever since some cretins hacked into my web host and ruined four of my sites. Jim got home a little after four, and called up to me that Kirby was bleeding. He must have just been licking the tumor nonstop while we weren't watching. He was bleeding quite a bit, and his muzzle and feet were covered in blood. I knew what that meant as I had discussed this with the doctor a couple weeks ago when he aspirated this latest lump. Mast cell cancer is incurable, and he would continue to get these tumors. It was time to let him go. I called the emergency clinic while Jim was cleaning things up to let them know what was going on. It was the same facility where we had met with the oncologist, so they had a file on Kirby. After we got home I washed up the bloody towels and Jim's bloody clothes. I texted or emailed close family members to give them the news, asking them not to call us last night. We couldn't handle talking to anyone. Neither one of us ate dinner, or slept much last night. We were missing our bed buddy. When I went downstairs this morning, the first thing I did was check to see if Kirby's water bowl was filled. The pill bottles lined up on the counter made me cry. I woke up my computer only to see the website of the emergency clinic staring me in the eyes. The first email I read was from Merial, reminding me to apply Kirby's flea treatment. Since I was bawling anyway, I went ahead and packed up all of his toys, leashes, food, etc. I discarded what needed to be thrown away, and hope to donate a couple of unused leashes and poop bags to someone who can use them. I also have an unopened box of flea treatment and sealed Heart Guard pills that I am hoping a shelter can use. We'll see...I can't deal with that yet, but at least it is all out of site. None of it will be out of mind, however. For the third year in a row Jim and I were able to go to Washington, DC to be with Andy and Megan for Thanksgiving. Katie has also been able to make it each time to join us. This was the first time all five of us have been together since last Christmas, so it was pretty special. The weather was cooperative and we arrived the day before Thanksgiving with no problems. 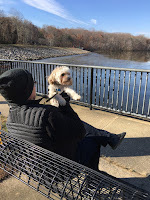 Megan picked us up from the airport, and once we got our things settled, Jim and I took the granddog Monty for a walk. 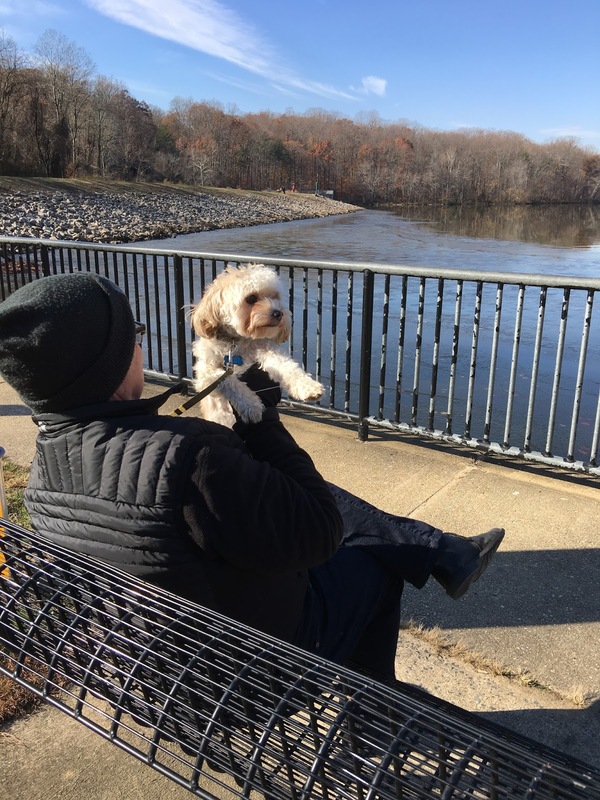 They are so blessed in that a wonderful county park with hiking/biking trails and a lake are located an easy walking distance from their house, so that is our route of choice with Monty. For an eight pound little squirt, this guy can sure go! We had a quiet day on Thursday, but Friday morning Jim, Andy and I headed out early to pick up some donuts at Duck Donuts. Oh my! You basically special order your donuts any way you like them. They were tasty! After lunch we went to the town of Occoquan, Virginia, which was founded in 1734. It is very quaint with some unusual shops, and is on the banks of a pretty river with a water fall. 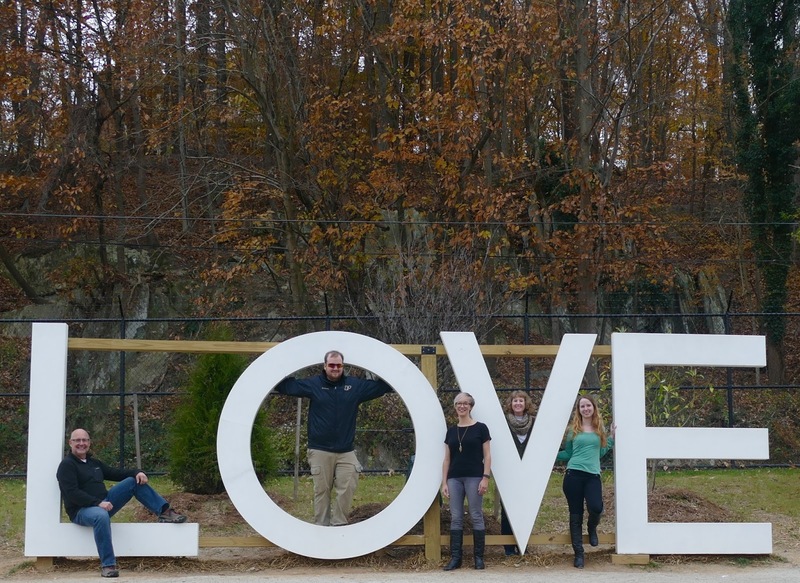 My favorite part of the town was the "LOVE" sign, where we had a family picture taken. It was a very popular photo op spot, as you can imagine. We were able to pick up a couple of Christmas gifts in town, so that was a bonus. Here's a tip - never buy more than you can fit in your suitcase for the return flight home. You're welcome. Saturday we drove to a couple of different wineries. Wine tasting is not my thing because I prefer a sweet wine, but I don't mind going along as I can always find something to photograph. The second winery had a nice bread/meat/cheese basket, so we enjoyed a late lunch or early dinner. They also had a sangria that was pretty tasty. We were somewhat lazy on Sunday, though we did go and visit Georgetown University. Katie is looking at graduate schools, and that one has made her short list. They have a very nice campus. We had all been looking forward to Monday, though. Andy and Megan had to work, so the rest of us took an Uber ride into the Washington, DC center. We began at the Capitol Building, thinking we'd just take a quick look around. But we got caught up in a tour and ended up spending a couple of hours there. I hadn't been inside since my junior year of high school. Our tour guide was so interesting and informative. 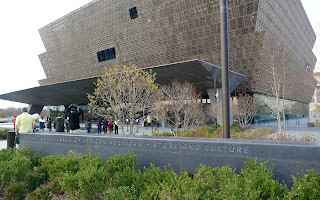 From there we went to the National Museum of African American History & Culture, which just opened in September of this year. Megan had been lucky enough to snag five tickets several months ago, and she and Andy arranged their work day to meet us there. 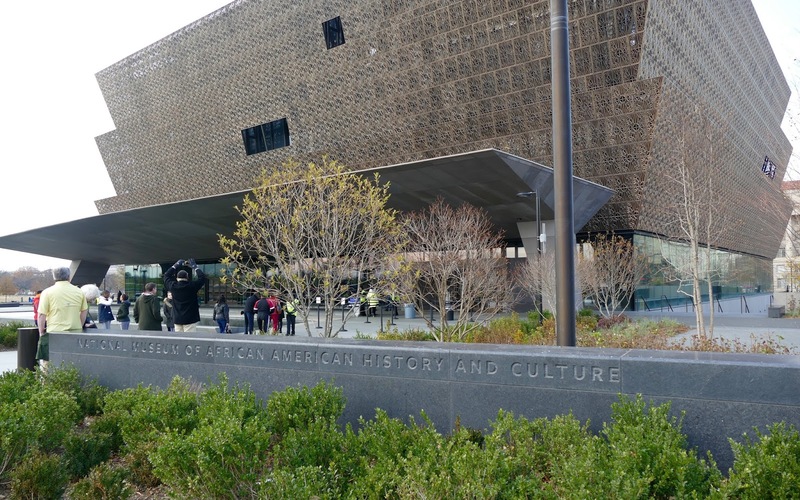 While this Smithsonian museum is free, you must have a timed ticket to get in. Currently there are no tickets available until next April! While it was crowded, our tickets were late enough in the day that there were no bus loads of school children there so that helped. There are over 36,000 artifacts contained in 350,000 square feet, so you need a lot of time to visit. We didn't have near enough as the museum closes at 5:30. But I can say that what we saw was heartbreaking, thought provoking and encouraging all at the same time. 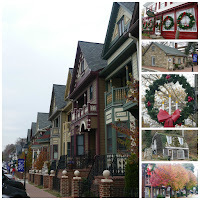 We will definitely go again on a future visit to the DC area. The next day Jim and I flew home and Katie headed back to LA. We had an event-filled week between playing tourist, enjoying family time and many romping rounds of Five Crowns. I love making these memories with the kids, and can't wait until we are all together again later this month. As Celine Dion sang, "These are the precious times..."